A contributor in Terre Haute, Indiana has a tiny brass eyeglass that, when peered through, reveals an image of Confederate president Jefferson Davis. February 1862: the Confederate South has seized the upper hand in the "War Between the States". In the North, opposition to President Lincoln grows as fears spread his armies will be defeated. Secret societies form in the Union states bordering the South, united in opposition to both Lincoln and the war. Those southern sympathizers operating north of the Mason Dixon line are surprisingly powerful and dangerous. 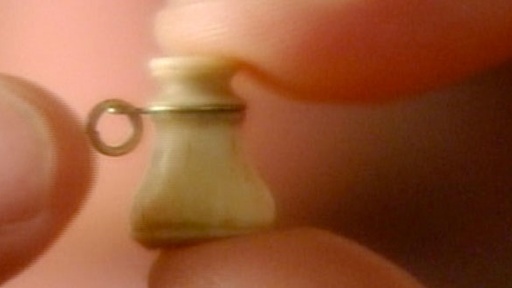 The owner believes miniature “Davis” eyeglass pieces were a wartime adornment of Confederate supporters in the North who used these objects to secretly identify themselves to one another. History Detectives travels to New York and Virginia to examine the intricacies of microphotography and the truth behind a possible sympathizer "secret handshake." Also with Elyse Luray Cannon House Could this family home once have been the headquarters of the kidnapper and slave trader Patty Cannon? Also with Elyse Luray Star Spangled Banner Is this the first official copy of the national anthem? Also with Wes Cowan George Washington Miniature Did the artist paint this portrait from life, and what is its surprising connection to the abolitionist White Matlack? Also in Season 4 Doc Holliday's Watch Was this watch a gift from the fearless frontier lawman Wyatt Earp to the gambler Doc Holliday? Also in this episode Howard Hughes Invention Was this oil drilling device really a Howard Hughes invention?